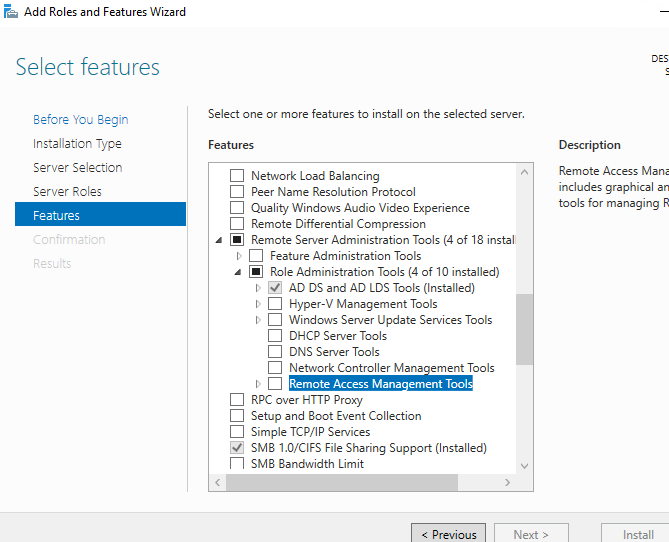 Windows Server 2016 Core - DC Role. so I googled, and followed all the guidance provided to reach a dead end... why is server manager not showing File services under the Features section and why is the PowerShell cmdlet failing? In fact, the rsat-dfs-mgmt-con is not available for core editions. we can copy the related two files from a GUI system which has been installed a rsat-dfs-mgmt-con in. Please feel free to let us know if you need further assistance or meet new issue. I haven't checked yet as I didn't have a server with DFRS mgmt tools installed already. I followed the rest of the DFSR recovery steps via MS supprot page, skipping the DFSRDIAG POLLAD step. It still succeeded, just find it rather annoying that AD services are allowed on core which requires DFSR for sysvol replication yet the mgmt tools are not available on core... what a misnomer no? The issue has been common and many people were affected when installed the rsat-dfs-mgmt-con feature in their windows server core. The issue could be solved by the GUI. If possible, We can build a virtual machine to install the GUI and deploy the dfs management tools feature. Meanwhile, I found an article about changing core to GUI type. It may be helpful. The DFSR is available for server core or GUI as the roles. If you need further assistance, feel free to let me know. I know HOW to do that, the point is, I shouldn't HAVE to do that. I also get that I can provide my issue to the "feedback hub". Also FYI: That no long applies for Server 2016, you can not simply switch between GUI and Core anymore. 1. Launched an attempt to remotely install it via Server manager, on a full GUI (2016) machine. I dont see the DFS Features on the GUI machine, for the core server (ie, DFS features are installed on the GUI machine, but not listed/visible from the server manager, when I try to install on it on the core machine). Dont know what to do once these files have been copied over to the core machine. Am I supposed to copy other files as well? 3. Ive tried adding Windows Features, but again, DFSR is not listed. What gives? The article/link above states DFSR services should be available. Is it or not?